The Yorkshire Terrier’s coat is a combination of steel blue (on the body and tail) and tan. Their hair can grow particularly long, especially around the face, and often requires trimming in order to prevent it dipping into the food or water bowl. It’s true that Yorkshire Terriers do not shed as much as other dogs due to their lack of an undercoat, but they do shed a little. Coats require weekly brushing, and longer hair around the head often needs to be tied back to keep from obstructing the dog’s vision. The average Yorkshire Terrier weights around 3.2kg and stands between 15 and 17.5 cm tall. Their lifespan is generally between 12 and 15 years. Yorkshire Terriers may be small, but they are energetic little dogs who require a daily walk and playtime to stimulate them both physically and mentally. 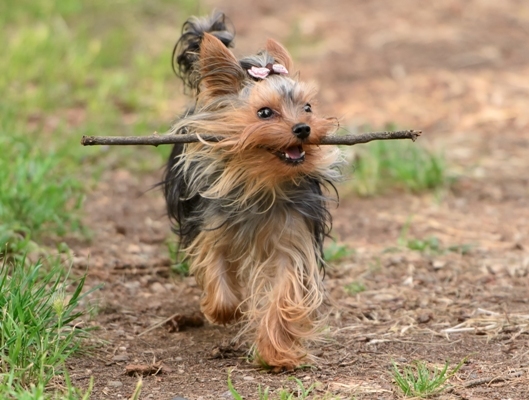 If your Yorkie often runs around the house for no reason, this could be a sign that they need more exercise. 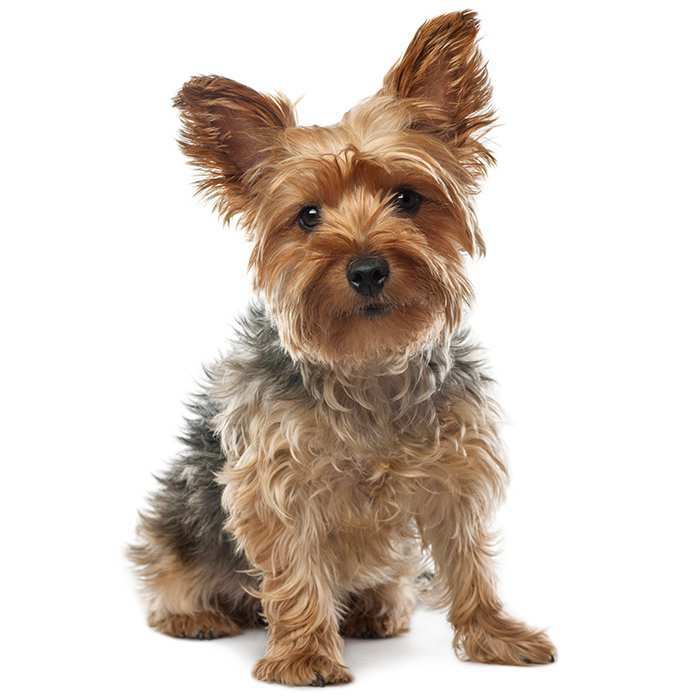 Owners who are consistent with rules and are patient with the dog will have no trouble training their Yorkshire Terrier, thanks to their working dog roots, however housebreaking can occasionally be a challenge. Some believe the Yorkie to be a “yappy” breed, but some owners have found that their dog, when its needs are satisfied, is a quiet and happy dog. Their barking habit makes them great watchdogs. 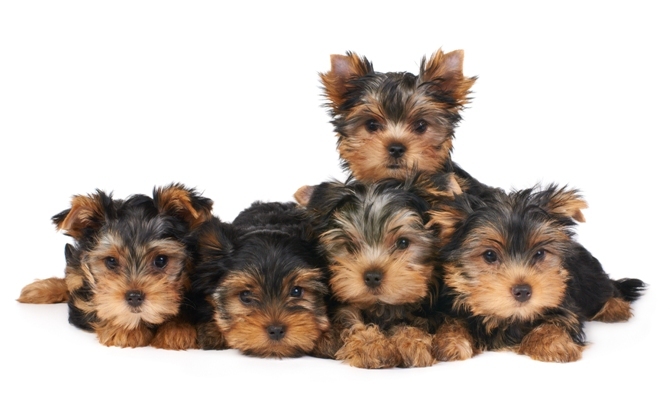 Yorkshire Terriers are not recommended to households with young children, as they can often mistake the dog for a toy and play too roughly or drop or step on them. Yorkies are prone to Small Dog Syndrome, which occurs when owners allow their dog to get away with things they would not allow a large dog to, which can lead the dog to believe they are the pack leader. Household Accidents. One of the biggest risks to Yorkshire Terriers is simple household accidents. 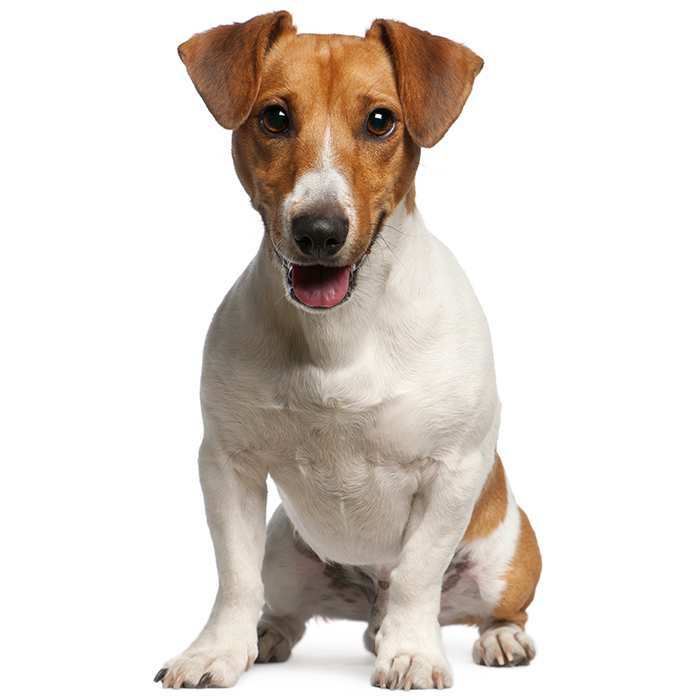 Because they love to follow their owners around and can often sneak up quietly behind you, their small frame can be prone to broken bones or worse. It is for this reason that young children should be watched carefully around the Yorkie to ensure they treat it gingerly. Patellar luxation is a common issue among small dog breeds, and occurs when the patella is not lined up properly, causing the knee cap to fall in and out of place. This can lead to lameness or an abnormal gait in the dog, but for dogs affected with only mild cases, no treatment is required and they can lead normal lives. For more serious cases, surgery can be performed in order to correct the patella. Portosystemic shunt is a condition which affects the flow of blood between the liver and the rest of the body. Because the liver controls detoxing and metabolism, this can be a serious issue. Signs of the condition include abnormal behaviour, loss of appetite, low blood sugar, gastrointestinal issues, urinary tract issues, intolerance to medication and stunted growth. Corrective surgery is an option, and a special diet may be prescribed to help combat the issue. Hypoglycaemia, or low blood sugar, is common among dogs that are extremely stressed. Symptoms include weakness, confusion, an abnormal gait, and seizures. Treatment is available. Collapsed Trachea. The trachea, which carries air to the lungs, can collapse easily in dogs, causing a dry, hacking cough often sounding like a goose honk. Surgery can be performed to fix the trachea and medication may also be prescribed. Reverse sneezing can occasionally be confused with a collapsed trachea, but is much less serious. It occurs when the dog becomes over-excited, drinks/eats too quickly, or if there is an increased amount of irritants in the air. Though it can be scary to witness, it will stop as soon as the Yorkie relaxes. Stroking the dog’s throat may help the dog calm down. Other Issues. Yorkshire Terriers can also experience eye infections, anaesthetic intolerance, bronchitis, tooth decay and gum disease. The Yorkshire Terrier, named after the region of England from which it originated, arose out of a combination of ratter and working dogs. It came out of intentional crossbreeding of many terriers including the Clysedale Waterside, Paisley, Sky, Dandie Dinmont and Black and Tan English Terriers. The Clyesdale Waterside played an important part in the creation of the Yorkshire Terrier, especially its appearance, which was small, greyish blue, and had long hair. It was brought to Yorkshire by Scottish weavers around the 1850s. Due to its working dog and ratter roots, English nobility were not fans of the Yorkshire Terrier, believing it to be common, but soon enough it became the toy dog of choice among wealthy Britons due to its elegant looks and small size. The Yorkshire Terrier was brought to the USA in 1872 and its breed standard was established by 1900. 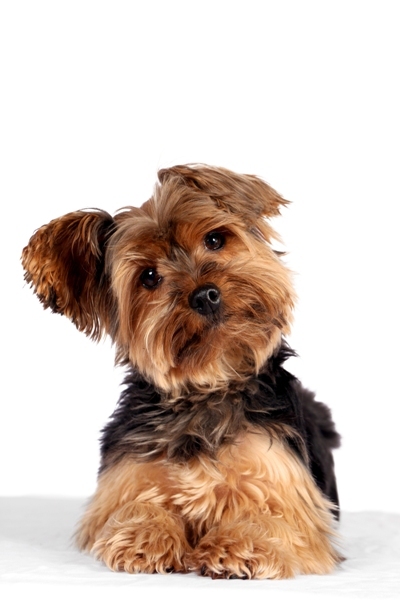 As of 2013, the Yorkie is the 6th most popular purebred dog in the USA. Smoky, a Yorkshire Terrier, was a famous dog who served in World War II who is credited with a surge in popularity of the breed. It is possible that he was also the first therapy dog on record. She survived 150 air raids and was awarded 8 battle stars. Audrey Hepburn, Joan Rivers, Eva Gabor, Whitney Houston, Britney Spears, Paris Hilton, Miranda Kerr, Simon Cowell, and Gisele Bundchen have all been Yorkie owners. 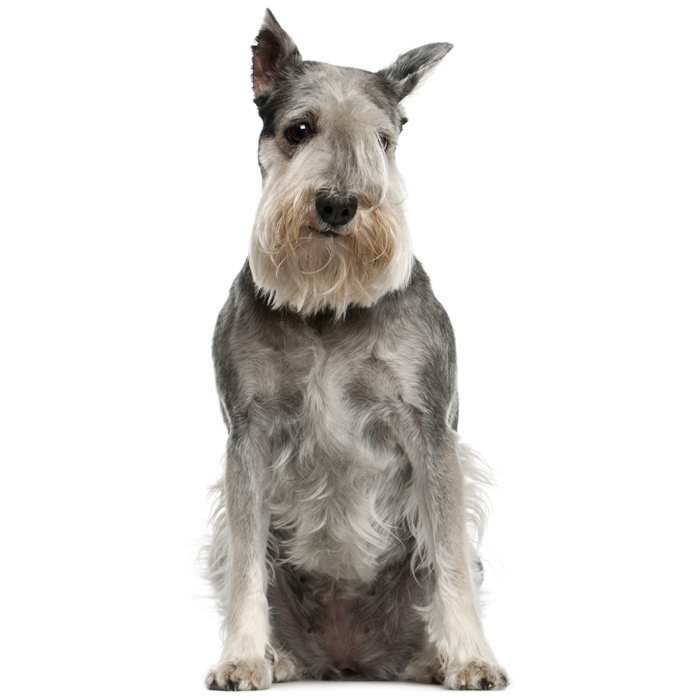 Yorkshire Terriers were known as “broken-haired Scotch Terriers” until 1870. The smallest dog in recorded history, Sylvia, was a Yorkshire Terrier who stood at only 6.3cm tall and weighed only 115 grams. During the first couple of weeks of their lives, Yorkies sleep 90% of the time. In 1991, a 5.5 kg Yorkie named Oliver saved his 79-year-old neighbour from an attack by a 36 kg Akita. The Akita was taken into custody and the Yorkie survived the fight and needed 9 stitches.